The foot or service brakes are hydraulically actuated in all four wheels. The brakes are of the two-shoe, double anchor type and have chrome-nickle alloy iron drums. 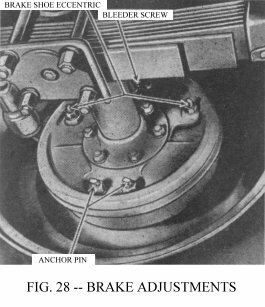 The hand brake is mechanically operated through a cable and conduit to an internal expanding type brake mounted on the propeller shaft at the rear of the transfer case. In operation, pressure is applied to the hydraulic liquid in the master cylinder through the foot pedal, forcing the liquid through the lines and into the wheel cylinders. The pressure forces the pistons in each wheel outward, expanding the brake shoes against the drums. As the pedal is further depressed, higher pressure is built up within the hydraulic system, causing the brake shoes to exert greater force against the brake drums. As the brake pedal is released the brake shoe return springs pull the shoes together forcing the fluid out of the cylinders and back into the lines toward the master cylinder. The master cylinder may be reached by removing the five screws in the inspection cover on the toe board below the steering column. Keep the master cylinder reservoir full at all times. Use only genuine hydraulic brake fluid. Check the level each 1000 miles and use care, when removing the filler cap, that no dirt enters the reservoir. The fluid capacity is approximately ¾ pts. The hydraulic brake system must be bled whenever a fluid line is disconnected or air enters the system due to low fluid level in the master cylinder reservoir. A leak in the system may be indicated by a “spongy” pedal. Air trapped in the system is compressible and does not permit pressure, applied to the brake pedal, to be transmitted solidly to the brakes. Should bleeding be required, consult your Willys-Overland Dealer. When the brake lining becomes worn the effective brake pedal travel is reduced. The effective travel may be restored by adjusting the brake shoes. First make sure that there is ½” pedal travel, without moving the master cylinder piston, which is necessary to prevent the brakes from dragging due to expansion of the hydraulic liquid. Jack up the wheels to clear the floor. Adjustment is made by relocating the brake shoe eccentrics Fig. 28. Loosen the lock nut for the forward brake shoe and hold the nut while turning the eccentric toward the front of the car, with another wrench, until the shoe strikes the drum. Turn the wheel with one hand and release the eccentric until the wheel turns freely then hold the eccentric and tighten the lock nut. To adjust the reverse or rear shoe, repeat this operation except turn the eccentric toward the rear of the car. Do this on all brakes and check the fluid level in the master cylinder reservoir. As pressure is equal in all parts of the system, the brakes are self-equalizing. Make sure that the brake handle on the instrument panel is fully released. Give due attention to the cable and operating linkage to see that they do not bind. Should the cable fail to slide freely into the conduit, remove and lubricate it. Rotate the brake drum until one pair of the three sets of holes are opposite the two adjusting screw wheels in the brake. Use the edge of the holes as a fulcrum for a suitable adjusting tool or a screw driver, rotate each notched adjusting screw by moving the handle of the tool away from the centre of the drive shaft until the shoes are snug in the drum. Back off seven notches on each adjusting screw wheel to secure the correct running clearance between the shoes and the drum. Should either the foot or hand brakes require relining or other extensive work, contact your Willys-Overland Dealer.